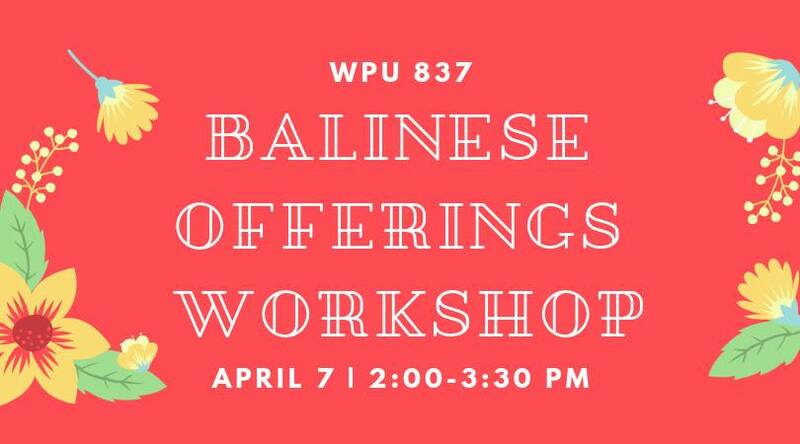 PennsylvAsia: Balinese Offerings Workshop, April 7 at Pitt. The University of Pittsburgh's Asian Studies Center and Department of Music will present a Balinese Offerings Workshop on Sunday, April 7. Learn how to make beautiful palm and floral offerings in the traditional Balinese style with expert artisan Ida Ayu Kumalayoni. A brief lecture on offerings in Bali will be followed by a hands-on workshop. It will run from 2:00 to 3:30 pm in 837 William Pitt Union (map).